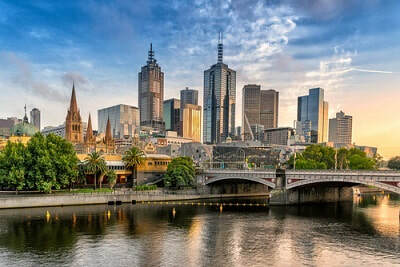 Melbourne, perhaps surprisingly, is the most popular destination for US expats in Australia, with an estimated thirty thousand Americans living there. Melbourne is a thrilling place to live. Its European style architecture, its cuisine and nightlife, the beaches, and the internationalist community all guarantee American expats in Melbourne an unforgettable experience. The only downsides for US expats living in Melbourne are the winters and having to file both US taxes as a US citizen, and Australian taxes as a Australian resident. Filing both tax returns needn’t be as complicated as many American expats living in Melbourne at first think however. Most in fact don’t end up owing the IRS anything, even though they still have to file. For expats whose only income is from employment in Australia, Australian income tax is deducted at source and there’s no need to file a Australian tax return. The Australian tax year runs from July 1st to June 30th, and expats who do have to file an Australian tax return must do so by October 31st following the end of the tax year. Australian tax returns are filed to the Australian equivalent of the IRS, which is called the Australian Tax Office (ATO). Australian income tax rates range from 0% to 45%. There is also a social security tax of either 2% or 3.5% of income, depending whether you have private medical cover, and a mandatory pensions saving tax also applied to salaried income called Superannuation. The US and Australia have a Totalization Agreement in place, meaning that IS expats living in Melbourne won’t have to pay both US and Australian social security taxes. The Agreement stipulates which should be paid, depending on each expat’s circumstances. Expats have an automatic extension until June 15th to file their US tax return, with a further extension available upon request until October 15th. Any tax owed is still due by April 15th though.. While it’s always necessary to file, there are several exclusions that expats can claim that will reduce most expats’ US taxes payable to zero. The Foreign Tax Credit gives US expats a $1 tax credit for every US dollar equivalent of tax that they’ve paid abroad. For expats in Melbourne paying more Australian tax than they owe to the IRS, this means that they can claim more US tax credits than the US tax that they owe, eradicating their US tax liability while giving them excess US tax credits that they can use in the future. Expats can claim the Foreign Tax Credit by filing form 1116. For US expats earning less than around $100,000 and paying less Australian tax than the US tax due, the Foreign Earned Income Exclusion is often a better option. The Foreign Earned Income Exclusion lets expats who can prove that they are either permanently resident in Australia, or that they spent at least 330 days outside the US in the tax year, exclude the first around $100,000 of their income from US taxes. As well as filing a federal tax return, US expats in Melbourne who have more than $10,000 in total in foreign bank or investment accounts at any time during the tax year are required to file an FBAR (Foreign Bank Account Report). In practice, filing an FBAR means filing FinCEN form 114 online before October 15th. Because FBARs are filed to FinCEN rather than to the IRS, the penalties for not filing are much higher, so it’s important not to neglect FBAR filing, especially as almost all foreign banks and investment firms now provide the IRS with information about their US account holders directly, including balances. Expats living in Melbourne with financial foreign assets (but not tangible physical assets such as property, or cars for example) worth over $200,000 at any time during the tax year are also required to report them by filing FATCA (The Foreign Asset Tax Compliance Act) form 8938 with their federal return. Expats who have been living in Melbourne for a while but who didn’t know that they have to file US taxes can catch up with their US tax filing using an IRS amnesty program that allows them to avoid facing any penalties. The program is called the Streamlined Procedure, and to qualify expats must file their last 3 tax returns, their last 6 FBARS (if required), pay any back taxes that they may owe (often none, once they’ve claimed the most beneficial exclusions given their circumstances), and self-certify that their previous failure to file was non-willful, so not willful avoidance. The Streamlined Procedure is a great opportunity for expats living in Melbourne who are behind with their US tax filing to become fully compliant before the IRS writes to them (at which point they would be most likely become liable to pay back taxes and fines).